The expression of the transcription factor SOX4 is increased in many human cancers, however, the pro-oncogenic capacity of SOX4 can vary greatly depending on the type of tumor. Both the contextual nature and the mechanisms underlying the pro-oncogenic SOX4 response remain unexplored. Here, we demonstrate that in mammary tumorigenesis, the SOX4 transcriptional network is dictated by the epigenome and is enriched for pro-angiogenic processes. We show that SOX4 directly regulates endothelin-1 (ET-1) expression and can thereby promote tumor-induced angiogenesis both in vitro and in vivo. Furthermore, in breast tumors, SOX4 expression correlates with blood vessel density and size, and predicts poor-prognosis in patients with breast cancer. 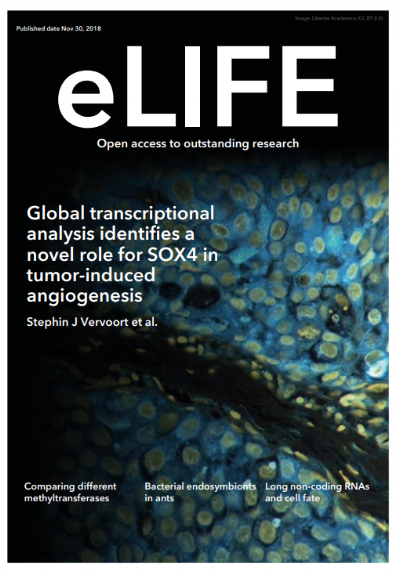 Our data provide novel mechanistic insights into context-dependent SOX4 target gene selection, and uncover a novel pro-oncogenic role for this transcription factor in promoting tumor-induced angiogenesis. These findings establish a key role for SOX4 in promoting metastasis through exploiting diverse pro-tumorigenic pathways. This work, pioneered by Stephin Vervoort, Olivier de Jong, Cindy Frederiks and Guy Roukens is a collaboration between many groups within The Netherlands and the United Kingdom and is published in eLife here.